Cam had quite a bit of news to report this week. 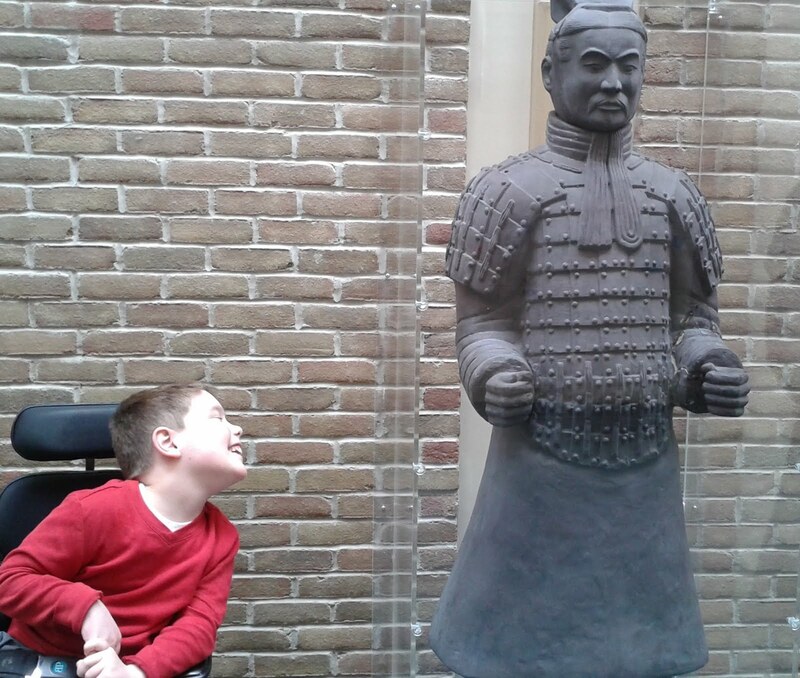 In his elementary school, he is part of a Chinese inclusion class. 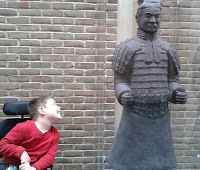 Meadow Brook had a Chinese warrior statue named "Bing" donated to the school. He resides in a glass case for all the kids to see. 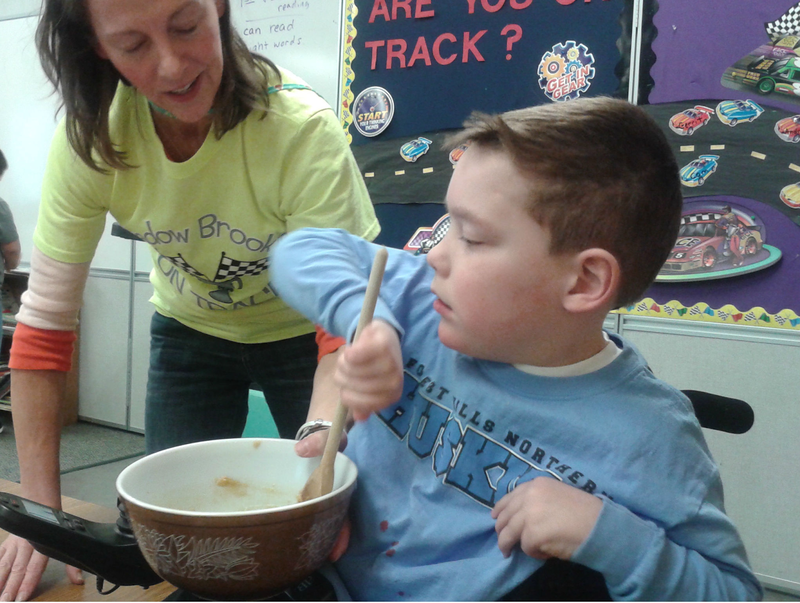 Cam also made sesame cookies and brought home a delicious sample! China is one of the top three producers of the sesame seed. 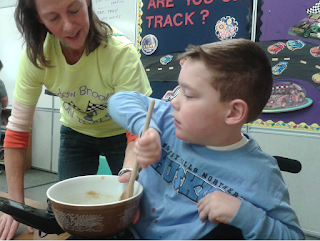 Cam thought it would be a good idea to share the recipe with everyone who reads the blog. 2. Combine 1/2 cup softened butter, 1 cup brown sugar, 1 egg, 1 teaspoon vanilla with mixer. 3. Add 1 & 1/4 cup flour, 1/2 tsp baking powder, 1/4 tsp salt with mixer. 4. Toast 2/3 cup sesame seeds. 5. Put 1/3 cup toasted sesame seeds in and mix again. 6. Shape dough in 1-inch balls. 7. Put 1/3 cup toasted sesame seeds on paper plate. 8. Roll cookie dough balls on sesame seeds. 9. Place on greased baking sheet and flatten with hand. 10.Bake for 10 minutes- let cool for 5 minutes and enjoy! A very sweet treat, outside of cookies, was set up over the weekend. Our new friend, Melissa has parents who breed golden retrievers. We were invited to see them on their last day at home before adoption into the community. One night, Chris was providing an explanation of A.M. and P.M. to Cam. "O.K. Dad, tomorrow I will say 'Good A.M.!" Chris was re-assembling some exercise equipment and running into some difficulties. "Dad, they just don't make it like they used to in the old days"